The topic of service animals and other types of animals that help people with disabilities has become nearly too hot to handle in recent years. This is an area where multiple laws, which sometimes overlap, apply in various settings. Many of these laws have different requirements and even fundamental differences in how these animals are defined. At the same time, most laws recognize a similar balance between rights and responsibilities, and establish limitations based on valid health or safety concerns with animals in certain settings. The language and terms that describe various types of working animals or animals that help people with disabilities are not consistently used or understood. When different people say “service animal,” “assistance animal,” “comfort animal,” “emotional support animal,” or “therapy animal,” they are not necessarily talking about the same thing. This term is currently defined in two different ways under the ADA. The U.S. Department of Justice (DOJ) has one definition and the U.S. Department of Transportation (DOT) has another (read on!). Generally, service animals are trained to perform specific tasks (guiding, retrieving, alerting, etc.) and work for one particular individual with a disability, often for the life of the animal. These terms are generally used interchangeably. Emotional support animals may be socialized and obedience-trained, but they are not trained to perform any specific disability-related tasks. They provide benefit passively; their mere presence is comforting. They are also usually paired with one particular person, often for life. Therapy animals are typically considered those which are trained to accompany handlers to places like nursing homes, hospitals, or schools to provide therapeutic benefits, such as comfort or socialization, to the general populations there. These are working animals, but they do not meet ADA definitions of “service animals” because they serve general populations rather than particular individuals. The U.S. Department of Housing and Urban (HUD) uses this term in relation to the Fair Housing Act (FHA), as well as Section 504 of the Rehabilitation Act (for recipients of HUD funding). The term can include animals of various types that perform tasks or provide emotional support for individuals with disabilities. Again, however, there is not universal agreement on the meaning and use of these terms. 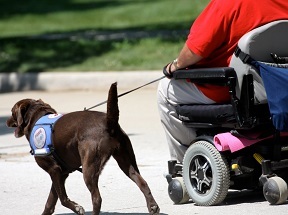 Let’s take a look at some of the laws that address animals that help people with disabilities. The ADA itself does not define or address service animals. Animals are not even mentioned in the statute, but concepts like “reasonable accommodation” and “reasonable policy modifications” are established, and various federal agencies are charged with issuing regulations to guide implementation of the different parts of the law. These titles of the ADA are regulated and enforced by the U.S. Department of Justice (DOJ) and the U.S. Department of Transportation (DOT). DOT’s regulation covers transportation programs and services. DOJ’s Title II regulation covers all other types of programs and services provided by state or local governments (public health or social services, recreation programs, court systems, libraries, museums, schools, etc. ), and DOJ’s Title III regulation covers a variety of places of public accommodation (privately owned and operated businesses such as stores, restaurants, movie theaters, hotels, fitness centers, banks, professional offices, and many others). Until 2010 the DOJ and DOT regulations defined service animals the same way (“any guide dog, signal dog, or other animal individually trained to do work or perform tasks for the benefit of an individual with a disability …”). In 2010 DOJ revised their regulations and eliminated the “other animal” part of the definition; now only dogs can be considered service animals under DOJ’s rules. A service animal can be any type, size, or breed of dog, but cannot be any other type of animal. Cats, monkeys, goats, rats, snakes, rabbits, pigs, or other types of animals, regardless of whether they have been trained to perform tasks for people with disabilities or how well-behaved they might be, are not considered service animals under DOJ’s rules. DOJ did include a unique new provision in their 2010 regulations for individuals with disabilities using miniature horses which are similar to service dogs. State and local government agencies and private businesses may take certain additional factors into consideration before allowing individuals to be accompanied by miniature horses (such as the size and weight of the miniature horse), but the provisions are otherwise similar to those related to service dogs. DOT has not revised their ADA rules in relation to service animals, so their definition is not limited to dogs. The other provisions remain the same, but within transportation systems covered by DOT’s rule, such as city bus or commuter rail systems, individuals with disabilities may be able to use other types of service animals (for example, cats). Service animals must be individually trained to perform active work or tasks for an individual with a disability, and animals that provide emotional support or comfort through their presence alone are not considered service animals. Many animals are trained, however, to perform active tasks that are designed to reduce anxiety or affect behavior for people who have what some might consider “emotional” disabilities. For example, an animal may be trained to take action (applying gentle pressure by leaning against its owner, pawing him, etc.) to alert an individual with an psychiatric condition to take medication or move away from a situation that is becoming stressful. This is a service animal, not an emotional support animal, even though the service provided may result in some emotional comfort or enhanced well-being. Service animals must be under control, house-broken, and well-behaved. Individuals can be required to remove from the premises any animal that is out of control, which would include not only animals that may be engaging in disruptive or threatening behavior like incessant barking or growling, but also animals that have been left unattended. When an animal is excluded for valid reasons, the individual with the disability must still be allowed to access goods and services without the animal. When an individual enters a place (or vehicle) covered under Title II or Title III, the entity can ask the individual if the animal is a service animal needed because of a disability, and what work or tasks the animal has been trained to perform. These questions can only be asked, however, if the answers are not obvious. For example, if an individual using a wheelchair enters a store with a harnessed dog pulling the wheelchair, it would be inappropriate to question the individual. Individuals cannot be questioned further about their disabilities or the animals’ training, nor can they be required to produce documentation or certifications. Covered entities cannot charge fees to allow individuals to be accompanied by service animals, although they can charge people for any actual damage caused by their animals. For example, a hotel cannot charge a “pet” fee or an extra deposit before permitting a service animal on the property, but if the animal actually causes damage that would require more than routine types of cleaning, the hotel can charge guests the same way they would charge any other guest who causes similar damage. This brief (approximately 15 minutes) conversation about service animals under Title II and Title III of the ADA outlines the definitions of service animals under Department of Transportation and Department of Justice regulations, and answers common questions that businesses and state or local government agencies often have about procedures for interacting with individuals with disabilities who use service animals. The way Title II and Title III address service animals has gotten so much attention that the issues surrounding people with disabilities using animals as reasonable accommodations in the workplace is often overlooked or misunderstood. Title I is regulated and enforced by the U.S. Equal Employment Opportunity Commission (EEOC). The EEOC’s regulations do not define service animals, but mention them as examples of “mitigating measures” (things people might use to help address the limitations caused by their impairments) or “reasonable accommodations” (things people might use specifically in the context of employment). The factors to consider when an employee asks to be allowed to have an animal in the workplace are essentially the same factors that are reviewed in relation to a request for any other type of accommodation: Does the individual have a disability as defined by the ADA? Is the animal needed because of the disability? Will allowing the animal in the workplace be reasonable, or will it create some kind of undue hardship? An animal used as a reasonable accommodation in employment does not have to be any specific type of animal or perform any specific type of work or task, but it must be needed by the individual for a disability-related reason. Employers are allowed to obtain documentation from qualified professionals, such as doctors or therapists, to verify an individual’s disability and need for accommodation, if either or both of those things are not already known or obvious. As we mentioned earlier, HUD uses the term “assistance animal” to encompass any type of animal that helps a person with a disability, whether the animal performs active work or passively provides emotional support or comfort. Where HUD has authority under the Fair Housing Act (FHA) or Section 504 of the Rehabilitation Act, covered entities must make reasonable accommodations in rules and policies to allow an individual with a disability to have an assistance animal. Covered entities include public housing agencies and other public entities that have authority over rules that affect residential housing, as well as many private landlords, housing managers, and condominium and homeowners’ associations. Housing that is associated with other programs or services, such as dormitories at colleges or long-term shelters for homeless people, is often covered by the FHA as well. Entities covered by the FHA may require limited documentation to verify a disability and need for an assistance animal, if those things are not already known or readily apparent. Extra fees may not be charged to allow individuals to have assistance animals, even if others are charged extra fees or deposits for pets. For additional information, read HUD’s Notice on Service Animals and Assistance Animals in Housing and the HUD/DOJ Joint Statement on Reasonable Accommodations under the Fair Housing Act. The Air Carrier Access Act (ACAA) is regulated and enforced by the U.S. Department of Transportation, through the Aviation Consumer Protection Division. ACAA regulations require airlines to allow individuals with disabilities to be accompanied by animals that have been trained to perform tasks, as well as untrained animals, including emotional support animals. DOT Guidance Concerning Service Animals in Air Transportation establishes procedures, which allow airlines in some cases to require documentation of a passenger’s disability and need for an assistance animal. Assistance animals are usually allowed to travel in the cabin of the aircraft, but space limitations and other factors, such as animals that may cause a health or safety concern or a significant disruption in service, may prevent this. DOT considers some types of animals inherently risky, and does not require airlines to carry them in aircraft cabins; service animals such as reptiles, rodents, and spiders will typically be carried in the cargo hold. For more information, check out DOT’s guidance on disability issues in air travel. It’s always important to find out about state or local laws that may apply to various situations involving service animals. For example, many state laws extend protections to service animal trainers, and require covered entities to allow them into public places with animals in training, which the ADA does not require. On the other hand, some state or local laws have more restrictive provisions, which would be overridden by the ADA where it applies. For example, if a state or local law prohibited certain breeds of dogs in public places, but a person with a disability had a service dog of that breed, the ADA would override the state law in that instance. Likewise, when federal laws have differing provisions, whichever provisions are more generous to individuals will prevail. An individual gets “the best of both worlds,” and covered entities have to comply with all applicable laws by following the requirements that impose the least restrictions on individuals. For example, in a college setting where Title II or Title III of the ADA applies to the college as a whole, but the FHA also applies to the student dormitories, a student with a disability might not be allowed to take an emotional support animal into classrooms (where the ADA applies), but may be permitted to have that same animal reside with her in the dormitory (where the FHA also applies and is more generous to individuals when it comes to emotional support animals). The student might be required to produce some documentation to verify her disability and need for the assistance animal. On the other hand, if another student at the college has a service animal as defined in Title II or Title III (for example, the animal engages in some active task to alert the student to sounds because she is hard of hearing), the student can be asked the two questions outlined in DOJ’s rules, but cannot be required to produce documentation of her disability or her need for the service animal. The student will be allowed to have the animal accompany her everywhere on campus.